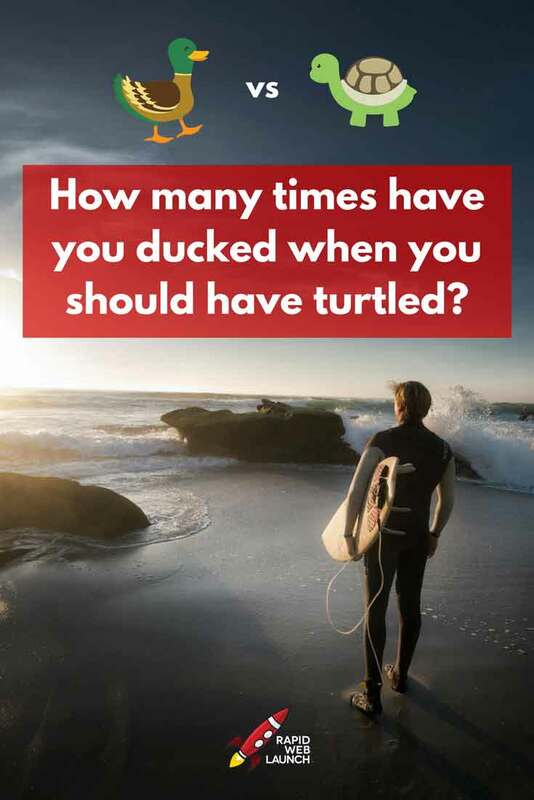 You are here: Home / Entrepreneurship / Managing Your Business / How Many Times Have You Ducked When You Should Have Turtled? The sun was out in all its glory, the fresh smell of salt filled the air, and my skin hadn’t yet been turned into a shade of red that would even make Elmo envious. I clutched my newly acquired surf board under my right arm, and headed for the 5 foot waves pounding the beach in front of me. After powering through the first 3-4 waves on foot, it was time to hop on the board and start paddling. The next wave was barreling towards me, and it was a doozy. Fortunately for me, I had just finished watching an hour worth of surfing tips on YouTube, where I had learned a method called the “duck dive“. You see, the hardest thing about surfing isn’t necessarily the actual surfing, it’s finding a way through the crushing waves to get to where you need to be to do the surfing. Often times, the waves are so big that you can’t simply go over or through them, you have to go under them. And that’s where the duck dive comes into play. In the duck dive, you simply push the front of your board down and let the oncoming wave gently pass over you. It sounds completely counter-intuitive, but it works. At least, when you do it right. As that first wave was just about to power through me like I was one of the specs of sand on the beach behind me, I began my duck dive. But I didn’t go anywhere. It was like trying to push a brick wall down. I continued floating right along the top of the water, and that wave blasted me off my board and sent me tumbling underwater. As my expert surfing friends would inform me, my method was right and my execution was great. But… I was using the wrong surf board. The vast majority of what we find is simply recycled and repackaged garbage. The same deceptive sales tactics that were used to peddle snake oil are now being used to sell “life-changing” courses and books. But buried deep in this steaming pile of tips and advice, we can find some genuinely useful and practical information. Information that can help you build a thriving online business. However, paths to success can almost never be exactly copied. Close, sure, but never 100%. And this is because there are so many smaller factors that influence the paths we take. These factors can be so seemingly inconsequential that they often go unnoticed, with many of them leaving us out of the decision-making process entirely. They just… happen. You can predict which junior hockey players will likely succeed in becoming professionals simply based on the date they were born. You can determine the likelihood of your plane crashing by learning what country your pilot and copilot were born in. The surprisingly simple reason why 20% of the richest men in mankind’s history were all born within just 9 years of each other. You can attempt to copy the success of these people to the letter, but there were circumstances, tools and random happenings that greatly attributed to their success. Things that you will never experience, have access to, or possibly even be aware of. I don’t want you to think I’m preaching a defeatist attitude. Far from it. I think we live in an exciting time. The internet is affording so many people the opportunity to build a successful business and design their own lifestyle. I’m simply commenting on what seems to be a very common theme in the online business world. People are latching on to (and paying for) a lot of books, courses, guides, groups, and video coaching from people who scream their alleged success from the rooftops. But, just because the hottest “Facebook Advertising 101” course worked for someone else, does not mean it will automatically work for you. You will need to take your own unique path to find similar success. With my personal attempt at surfing, I failed miserably because I didn’t apply the right tool to the knowledge I received. At that point, I could have assumed the people who shared this knowledge were lying. Or I could have thought that they were simply not smart enough and shared inaccurate information. Or I could have reasoned that I actually had everything I needed to be successful, I just sucked too much to do it right. Any one of those would have been a great excuse to give up and move on to something else. Instead, I decided to analyze the situation, do some more research and ask someone else for feedback. I got the information I was missing, made the correction, and successfully made my first duck dive on my next surfing excursion. When building your own business, there are going to be many times when you “duck” when you should have “turtled”. In that moment of failure, it likely won’t be clear why you’ve failed. If you really want to be successful, don’t fall into the trap of constantly comparing yourself to others. Define your goals, learn as much as you can, and work hard to build your own path. A path that is inspired by others, but not copied.